Hope your new year has had a great start. We’re putting out an open call for new monthly guest bloggers. You get one month to say what you want to say here on the F-word. Please check our “How to contribute” page if you’re unsure if you’re the right fit. Blog posts are usually about 800 words long. If you’re interested leave me a comment down below before January 20th 2015 and I’ll get back to you! 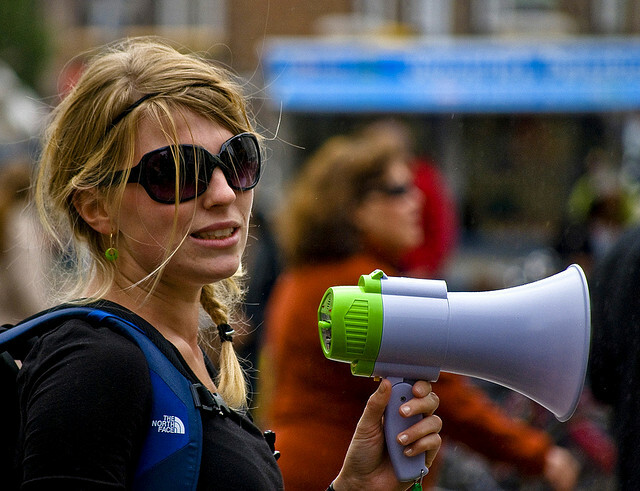 The woman in the photo above is holding a megaphone. Thanks Carl Johan Heickendorf for the photo! I’d be interested in contributing – looking forward to hearing from you. Hi – I am interested in this! I particularly write about feminism in film (particularly horror films!). Next month is Women in Horror Recognition Month, which might be of interest. Would love to hear from you! My name is Jess and I’m a 22-year-old blogger/journalist/fiction writer from the UK. I’d be extremely interested in a monthly guest blog spot on the F Word. It’d work well for me as I’m also studying for my MA whilst working on a novel/freelancing. My experience includes Papercut Magazine, Thought Catalog, Women Make Waves and Drafted Magazine. If you want to have a look at some of my past work, you can see it at jessicawragg.journoportfolio.com. My email address is on my profile – if you can’t see it, though, feel free to message me back. If you would like to hear my proposed topic please do get in touch. I would be very interested in writing for The F-Word. I have been an active feminist all my adult life (I’m 45 now), campaigning against sexism and misogyny. I always have a great deal to say on the subject! I feel that I am probably amongst your slightly older readership so could offer a different voice / point of view etc. Would love to get involved! 22 yr old with a degree in Journalism. Want to write about what feminism means to today’s youth and the issues teen girls have in embracing it. Hope to hear from you!